Together we can save the cheetah from extinction. CCF UK works tirelessly to raise awareness of the plight of the cheetah and to raise much-needed funds to support CCF’s important programmes in Namibia, which aim to address the biggest threats to the survival of the cheetah in the wild. With your support we can save a species. Join CCF UK today and help us continue our vital work. There are so many ways you can support us – by donating to our urgent appeal to tackle the illegal wildlife trade, by making a monthly commitment to support the wider aims CCF, or by sponsoring a cheetah. We rely on our committed supporters to help ensure a long-term future for the cheetah. Together, we can make a difference. CCF UK are hoping to raise £20,000 to help support 14 confiscated cheetah cubs, destined for the illegal pet trade in the Middle East. Please support the appeal by making a donation. Just £50 would ensure the cubs have enough food, nutritional supplements, and medicine to survive for one more day. You can make a recurring monthly donation by clicking on the Donate button below. Funds raised go directly to CCF Namibia to support our conservation programs. Our goal is to raise £3 million annually to scale up our impact. Every bit helps. Or select how much you would like to donate, either monthly or as a one-time donation. For reference, one digital satellite collar to help us track cheetah movements costs £3,000. 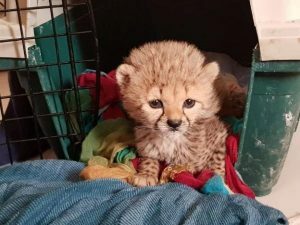 CCF cares for a number of orphaned, old or injured cheetahs who cannot be released back into the wild as they do not have the skills or physical capability to survive. Although CCF is not a rescue shelter, it does accommodate these non-releasable cheetahs. If another approved home becomes available, CCF relocates these cheetahs to an alternate captive facility. 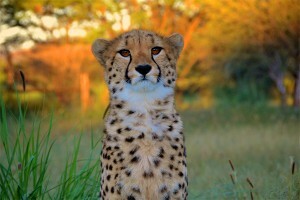 However, many of these cheetahs are permanent residents of CCF. By sponsoring a resident, non-releasable cheetah you can help us cover part or all of the annual costs for caring for them. Each cheetah costs CCF an estimated £3,000 a year in care and includes food, veterinary care and pen maintenance. Two e-mail updates on your sponsored cheetah. These updates are only sent by e-mail. Please be sure to include the e-mail address of the person who should receive these cheetah updates if other than yourself. A personalised plaque will be erected at CCF’s centre in Namibia. Please indicate the name of the cheetah you wish to sponsor in the message box in your donation form. Meet the Cheetahs. Maximise your Donation with GiftAid. By registering for GiftAid, CCF UK receives £12.50 for every £100 donated at no cost to you. Please sign up for GiftAid here. You can still sponsor a cheetah at a more affordable level. This option makes a great gift! Meet the cheetahs and pick which one you’d like to sponsor! Text CCFX01 £10 to 70070 to donate to CCF UK and make a difference today! Please email us at info@cheetah.org.uk with your contact details and email so we know who you are to thank you!